to bask in the shoreline grasses. It started as a very tranquil day. I took a long day-trip to Illipah Reservoir in White Pine County. It has been four years since I last fished Illipah, and it has always intrigued me as a fishing destination. I don’t exactly recall how I came to learn about Illipah. It may have been my brother Neal who first told me about it, or I could have seen it in the Nevada Department of Wildlife (NDOW) brochure and website. I do know that former Las Vegas City Manager, Larry Barton, fished it frequently in the late 1990s. Several times I heard him describe the Illipah fishing with great enthusiasm. Larry was a fly fisherman as well, so his commentary seemed to have more significance for me. corner of his mouth. He was maybe 12 inches, recently stocked this past spring. Department of Wildlife stocked 3,746 rainbow trout in May 26, and he was likely one of them. Illipah Reservoir was created in 1953 when Illipah Creek was impounded for irrigation purposes. In an agreement with the rancher to guarantee a minimum pool, NDOW paid for the dam construction. The reservoir was enlarged in 1981. Although located almost entirely on private land, the adjacent land is managed for recreation by the Bureau of Land Management under a cooperative agreement with NDOW. The Illipah Reservoir covers 70 surface acres to a maximum depth of 50 feet. Rainbow trout, stocked twice annually, and a self-sustaining population of brown trout currently inhabit the reservoir. The fishing is good year around, but it peaks in spring and fall. Illipah is located 34 miles west of Ely on Highway 50, where you turn south (left) at the sign and follow the dirt road 1½ miles to the reservoir. Muddy conditions occur when the road is wet, so use caution. on the other side of the Mokomoke Mountains. No evidence of the thunderclouds in this late morning photo. One fascination about Illipah, which I’ve never personally satisfied, is the nearby ghost town of Hamilton. Silver was discovered in Treasure Hill in 1867, two years after the end of the Civil War, which led to the creation of the town of Hamilton. In 1868 the silver rush resulted in over 10,000 people coming to the area. White Pine County was formed in 1869 with Hamilton as its seat. At that time there were almost 20,000 people living in Hamilton, and the town site grew to about two square miles. As was the case with most all of these mining boom towns, by 1870 the mining had come to a halt. A fire in 1873 signaled the coming end for Hamilton, and a subsequent fire in 1885 was the coup de grâce, and the county seat was then moved to Ely where it resides today. For a young family wanting to explore remote places in Nevada, Illipah and Hamilton fill the bill. Although the Illipah campsites are somewhat primitive, the BLM maintains the campground with picnic tables, fire pits, windscreens, vault toilets, and trash barrels. As the crow flies, Hamilton is about 7.5 miles southwest of Illipah. on their dark pigmentation, which I assumed was a condition carried with them from the hatchery. Today’s fishing action was extremely brisk, although no brown trout were landed, and no trout was over thirteen inches. In the six hours I fished, including a 30 minute thunderstorm delay, I hooked 45 rainbow trout, landing 34 and experiencing 11 long-distance-releases. That averages to a hook-up every 8 minutes, and a trout brought to hand every 10.5 minutes. I was pretty busy out there. The brown trout are the real attraction of Illipah for me. 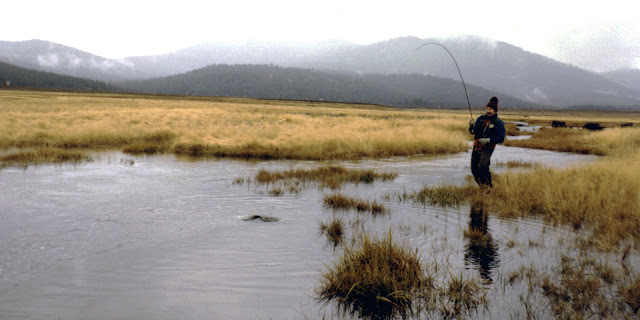 Landing the 17 inch brownie in 2004 on a small emerger nymph in the shallow shoreline was an awesome experience. I hope to replicate that again someday with a larger specimen. population of brown trout in the reservoir, but I did not catch one on this trip. heard the thunder. I opted to beach the Water Master and fish from the shore, which turned out to be great fun. The weed beds were floating on the surface in the shallow portion of the reservoir toward the inlet. Trout were rising and splashing next to them, as well as into the ankle-thin water right along the shoreline. When the mid-afternoon thunderstorm interrupted my tubing I decided to beach the Water Master and fish the western shoreline. That decision turned out to produce quite a bit of fun. I switched from my 5-weight to my 7½ foot 4-weight. Using a floating line with an array of nymphs (frankly, it didn’t seem to matter which ones), I was catching trout just 20 to 30 feet off the bank, and usually nestled up against the weed beds. It was very similar to dry fly fishing, and the light tackle made playing the smaller stocked trout enjoyable. trout from the shore along the weeds, often with splashy sub-surface takes of the fly. Almost like fishing a dry fly. ...such as rather large crayfish. A shore-caught trout of about 11 inches. I so enjoy fishing the 7½ footer. I had noticed what looked to be larger fish jumping on the eastern side of the reservoir, so when there was a lull in the thunderstorm I launched the Water Master again and oared over to check it out. There were larger fish working along the weed beds, and I was still using the light 7½ footer. Based on what I witnessed, I think several of the trout were in the 14 to 16 inch range. They were more wary, and often they’d move down the weed line just beyond my efficient casting range. I did manage to get a few strikes from larger fish, at least they looked like strikes, but I mistimed my reaction. I was enjoying the newly discovered “stalk and shoot” approach to angling when the second thunderstorm arrived (I had been watching the dark clouds approaching). It was then that I decided to get back to the Trout Truck and head home. Despite the trout being considerably smaller than those in Dacey Reservoir last May, I really enjoyed this trip. Normally the weather at Illipah can be close to 90° by mid-summer, but today's cloudy skies and intermittent thunder showers kept the temperature right about 70°, roughly 40° less than it was in Las Vegas… who wouldn’t appreciate that? And while there were a handful of anglers on this Thursday, I really had my run of the reservoir; for all intents and purposes I was angling in solitude. FisherDad taking refuge in Trout Truck, waiting for the thunderstorm to subside. Speaking of solitude, the driving time was a relished respite from a busy couple of weeks. For most all of the driving I kept the cab quiet except for my conversation with the Lord. As much as I try to make quiet time to be fully in His presence, there seems to always be a distraction or an interruption. I truly savor these trips to simply talk with God, and more importantly, to be able to listen to Him. John 8:47 says “Anyone who belongs to God listens gladly to the words of God. But you don’t listen because you don’t belong to God.” I don’t ever want to be in a place where the Word is not with me, or where Jesus says I don't belong to Him. I want to be like the young prophet Samuel who replied “Speak, your servant is listening” when he heard God call his name (1 Samuel 3:10). Many are familiar with Jeremiah 29:11 (“For I know the plans I have for you,” says the Lord. “They are plans for good and not for disaster, to give you a future and a hope”), but the Lord in verse 12 goes on to say “In those days when you pray, I will listen.” Of course, listening to the Word of God is only part of the battle; being obedient to his instruction is where the rubber meets the road. We must “give heed” to his word (Proverbs 16:20) and “put them into practice” (Matthew 7:24) because “those who hear the word of God and obey it” are blessed (James 1:25). So, my prayer is that you can be still and hear the voice of the Lord in your life, and let it guide your ways into eternity. Great read Mark. Nice to see how well retirement is treating you!